I’m hard-pressed to think of a song in recent years that I’ve hated as much as “Ho Hey.” It has to be one of the most inexplicable hits ever. For one thing, just on the most basic level, the song is annoying to listen to: it has people saying “ho! hey!” in the background after every line, which makes me want to punch all of them, something I believe is a rational, human reaction to anyone saying “ho! hey!” But like any song I truly despise, what makes “Ho Hey” so detestable is a unique combination of being overplayed, loved by people who should know better, and the musical trends that the song represents. What’s most frustrating about “Ho Hey” isn’t necessarily that it’s popular, but it’s the people that it’s popular with. A few years ago, The Current was a station that offered a reprieve from the overplayed music that we were forced to listen to when we went to shopping malls or grocery stores or parties. Now, its listeners just voted “Ho Hey” as the number one song of 2012. Interestingly, they didn’t have other pop songs on there like “Call Me Maybe” (which is an actual good song), indicating that the same people who love “Ho Hey” also think of themselves as educated listeners with discerning tastes. It’s easy to picture a Lumineers fan scoffing at those who listen to corporate pop artists while simultaneously listening to the most overplayed song in music today. In this respect, The Lumineers (along with other folk bands like Mumford and Sons) have pulled off the biggest trick of all: they’ve become massively popular while somehow maintaining a certain amount of “indie cred.” Music critic David Greenwald dubbed this genre “festivalcore,” calling Mumford and Sons, despite their popularity, “the kind of band your friends might not know if you ask, the kind that feels like a secret.” The Lumineers seem similar: despite the fact that they’re literally everywhere on the radio, people who listen to them still perceive themselves as special, as if they’ve uncovered a diamond in the rough. The success of “Ho Hey” is really just the chilling and horrific end-game of our unfortunate national love affair with mopey bland white guy folk. It takes popular trends in indie music (guys wearing silly antiquated clothing! soft guitars! non-threatening vocals!) and boils them all down to a nonsensical two-word catch phrase. One gets the impression that literally thousands of bands in the country could have written this song, but The Lumineers were the only ones willing to stoop to this level of pandering simplicity. Credit to them I guess: they seem like decent enough people, and I’m sure this has been a wonderful, unexpected surprise for them. That doesn’t make the bewildering success of “Ho Hey” any less annoying. It just really bums me out to see this kind of deliberate mediocrity become huge while many more deserving indie bands remain underground. And this isn’t some indie snob thing: I can appreciate a well-written, mainstream-oriented pop song. But “Ho Hey” is none of those things. It’s a dashed-off, stupid song that is only popular because it shamelessly caters to our culture-wide fascination with sad, goofy white guys that play the banjo. (I keep saying dudes or guys because this genre is completely male-dominated, which makes it even worse than it already is.) Surely we can do better than this. It’s almost like “Ho Hey” is popular in part because it’s so terrible. The Lumineers are “real” because they can’t write a hook and use gibberish instead of real words for lyrics, unlike those fancy pop stars who have legitimate talent and write songs in actual English. Sort of like how some people worship Adele because she doesn’t look like the other pop stars, maybe people worship The Lumineers because they don’t sound like the other big-name musicians (because they’re horrible)? Whatever. I’m done trying to figure this one out. This one’s on you guys. I had nothing to do with it. I had basically the same worries as everyone else: that it would sound cheesy or dated, that Shields had worked on it too much and drained it of its energy, or that new music from the band would just be awkward and unnecessary. It took about three seconds into the first song, “She Found Now,” for literally all of those fears to go away. It sounded like classic MBV, straight from 1991. The next 50 minutes or so probably qualifies as one of the most amazing musical experiences of my life, as I literally sat in my room with a dumb vacant smile on my face because everything about m b v was perfect. Now my brain has started having some new worries: namely that I might be insane for thinking that m b v, if not the landmark album that Loveless was, could be its equal on a purely musical level or maybe even better. 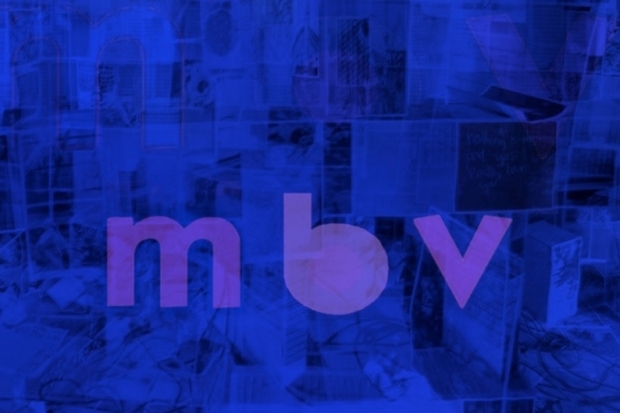 Just typing that makes me feel crazy, but I’ve never felt so strongly about an album this quickly: I think m b v is an instant classic, one of the best albums of the last 15 years, a perfect and worthy follow-up to Loveless that will satisfy any real MBV fan. And I don’t say any of this stuff lightly, because it’s really not in my nature to just instantly anoint an album like this. But just listen to this thing! It is insane. No other band could have made this, and bands have been trying to hijack My Bloody Valentine’s sound for literally decades. Think of all the “nu-gaze” groups that Pitchfork and other sites have drooled over, groups like M83, DIIV (lol), or Chromatics. Could they have done anything even approaching the mindblowing power of this album? Of course not. m b v is an album that seems to tell a story of the various paths that Shields went down in the 20 plus years since Loveless. “She Found Now” and “Only Tomorrow” are pretty close to that album’s sound, with the classic loud guitars and breathy vocals. From there, things get increasingly experimental and thus more awesome: “Is This and Yes” strips the band of their trademark tremolo’d guitar, but still sounds amazing and obviously identifiable as MBV. “New You” is just straight-up pop through an MBV filter, and it’s lovely. But the final three tracks are where Shields really lays down the gauntlet, as he adds some aggression to the classic Loveless sound while retaining its beauty and ambiguity. “In Another Way” is easily the best song on the album for me: Combining jungle-like drums (a long rumor about the album was about it containing “jungle music”), psychedelic riffing, and a classic shoegaze outro, the kind that takes you to another world that you never want to leave. The blistering instrumental “Nothing Is” segues into “Wonder 2,” which adds (gulp) drum n’ bass to their sound in a way that makes a frightening amount of sense. As I write this, I’m realizing I’m using a lot of words like “amazing” that don’t actually mean anything sans context. I don’t really care. Music writing is stupid, because nothing I am going to type out on my crappy laptop is going to articulate how perfect this album is, how much of a joke it makes all other current indie bands look like, and how it’s more than I could have ever imagined it to sound like, even after I spent so much time thinking about how the band could possibly follow up Loveless. It’s easy to forget that Loveless was not initially the universally praised behemoth that it would become — it only ranked 14th on the 1991 Pazz and Jop critics poll, behind albums by Ice-T and Metallica. I see the same thing happening with m b v already — critics are too cautious and timid to say just how good this album is. Of course, I’m well aware that I might just be hopelessly biased or reacting too strongly to my initial response, but I’m weirdly confident in my opinion here, so I’ll take the risk of looking stupid in a few years when people are still reading this for god knows what reason. My Bloody Valentine never needed to follow up Loveless for their reputation to be secure. But rather than diminish the legacy of the band like many feared it would, m b v actually adds to it even more. Other bands have spent the last 20 years trying to make the next Loveless, and all of them failed until Kevin Shields came back and did it himself. Yes, m b v is that good.